Yesterday, we attended First Bankers’ Banc Securities Annual Investment Seminar in downtown St. Louis. First things first–one of the speakers was St. Louis Cardinal manager Mike Matheny. He addressed the two worries fans have about this year’s Cardinals: their offense and their bullpen. Matheny believes the offense isn’t a legitimate concern and said the Redbirds will eventually start hitting. However, he did say that he shares the fans’ concern about the bullpen. If the manager’s predictions are correct, Cardinal fans can look forward to some high-scoring games with late inning drama this summer. But will the Cardinals be playing in the fall? On a less exciting note, but certainly more relevant to your portfolio, assistant VP and economist at the St. Louis Federal Reserve Bank William Emmons also gave a talk. This was the fourth year in a row where he has addressed the seminar, and he looked back at his previous predictions and how they have panned out. 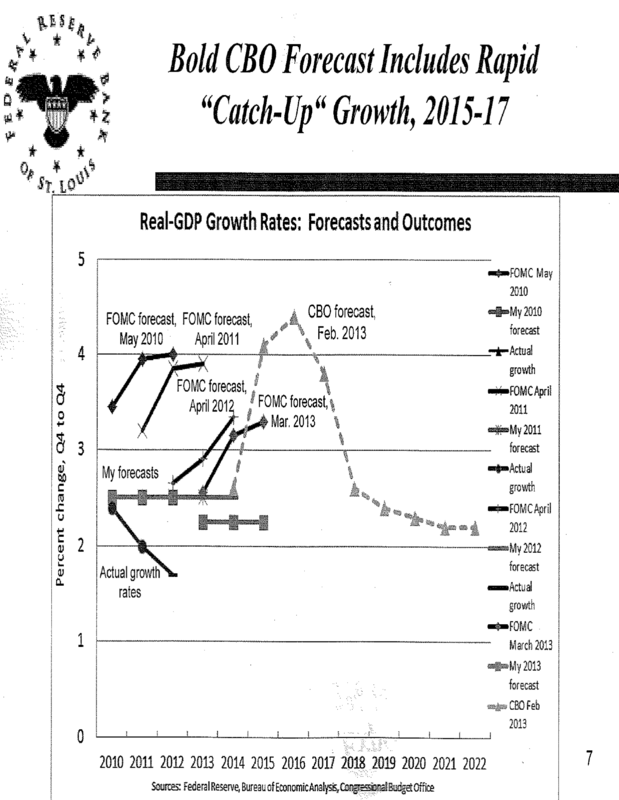 The following chart shows his predictions for Real GDP growth as well as those of the Federal Open Market Committee (FOMC) and the Congressional Budget Office (CBO). Mr. Emmons subscribes to the New Normal view of substandard growth in our economy for the foreseeable future. 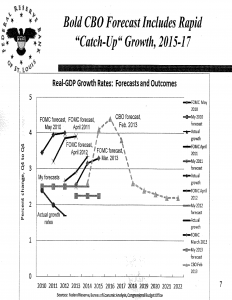 Interestingly, the FOMC continues to rachet down their growth estimates as the years go on. Perhaps they are starting to come around to the New Normal view. The real outlier here is the CBO estimate of robust growth in the 2015-2017 time line. Emmons noted that the last time the U.S. economy grew at this predicted pace for three years was the early 1980s. One obvious problem with this prediction is that in the 1980s the U.S. economy was coming off sky high interest rates and had the promise of reduced interest rates to spur the economy. 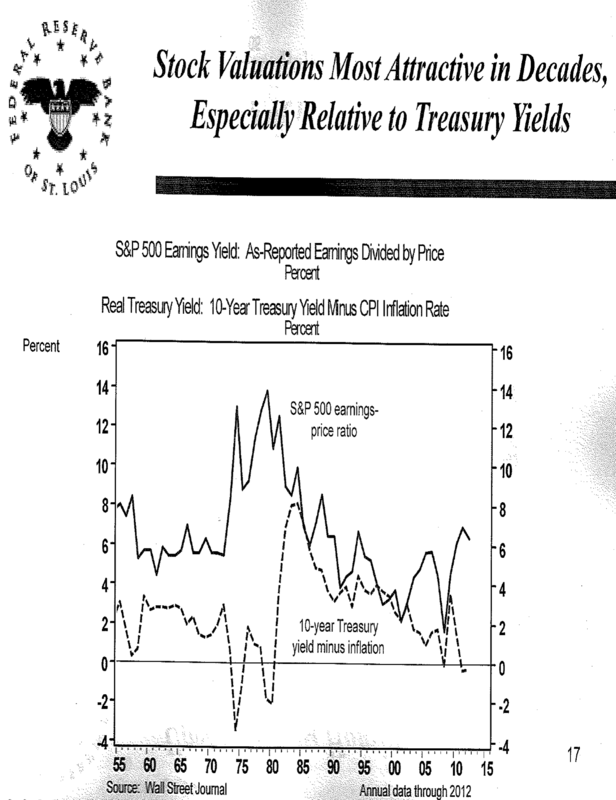 Today, we already have record-low interest rates, and there isn’t much gunpowder left in that gun. 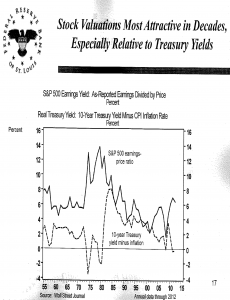 On a more positive note, Emmons did say that stock valuations were at their most attractive levels in twenty years and are especially attractive relative to the low treasury yields of today. Copyright © 2012 Sterling Capital Management, Inc.